Workday: Thomas Point – March 21, 2015 – Chesapeake Chapter U.S.L.H.S. 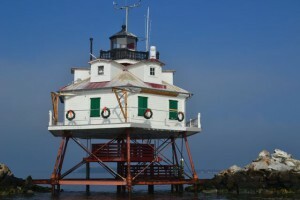 Photo by Anne Puppa Thomas Point Lighthouse as we approach for our first work day of the season. 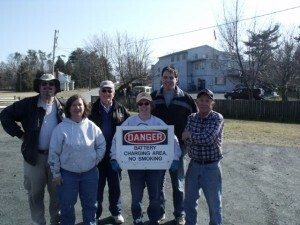 We had our first workday of the season to celebrate the inauguration of spring. But someone forgot to tell the weather. Saturday dawned gray and cold after a snowy first day of spring on Friday. 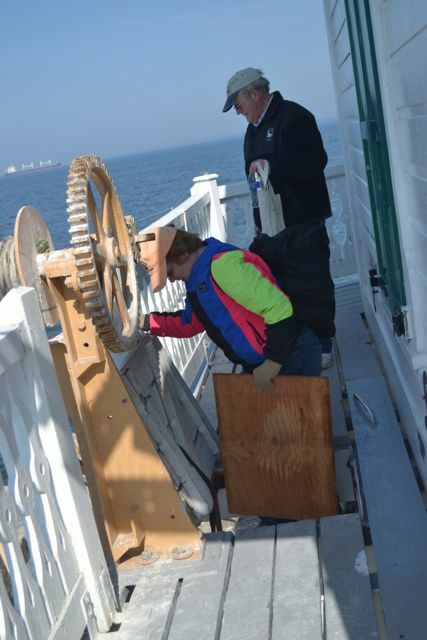 Seven volunteers boarded the Audacious and headed out to the light through the gloomy mist. As we approached we could see the wreaths still decorating the railings on each side of the cottage style lighthouse, adding a splash of color to an otherwise colorless landscape. Forecasters had called for temperatures in the 50s, but clouds of vapor accompanied any conversation…it was COLD in that lighthouse. We could see the winter had been a harsh one by the weathering of the light. The deck had some minor damage with one of the cleats on the landing dock missing. The light seems to have become a magnet for the birds this past winter – maybe due to the unusually large amount of ice on the bay. We’d never seen it so “decorated” as the dock and roof were caked with ample evidence of the birds presence. The light was opened and we went to work. 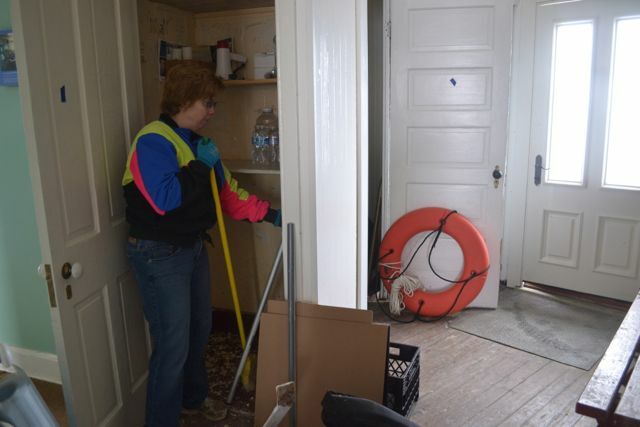 The holiday wreaths were removed and taken ashore; we emptied out the closets and organized the contents, removing much of the extraneous wood. The bird squawker (that is supposed to dissuade the type of congregation that obviously had taken place) had fallen silent so repairs were started on that. We scrubbed the lower deck and cleared some of the upper deck. But it will take a lot more work before it is inspection ready. The roof will need some serious power washing before the bright red it is known for shines thru again. Volunteers also cut some of the decorative railing posts in preparation for work later this year. The railings where the old shed was will need to be installed and the rest of the railing will also receive some attention. 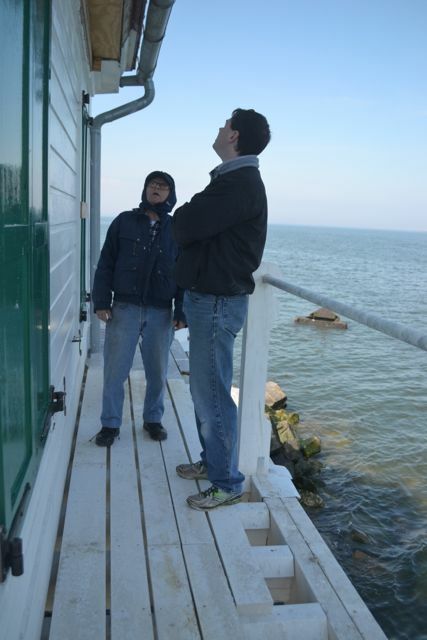 This was Hobie’s Statzer’s last day as coordinator for the Thomas Point workdays. 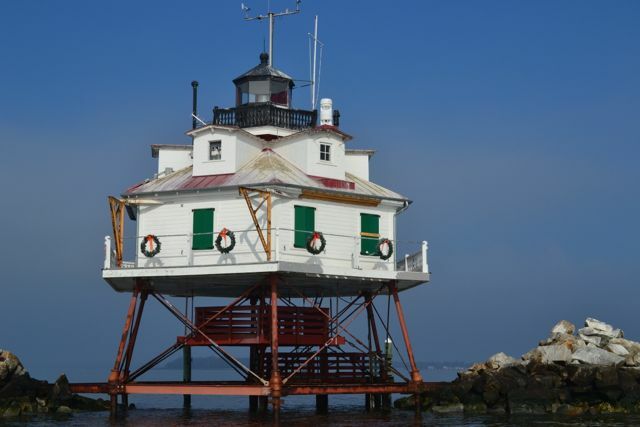 Over the last several years a tremendous amount of progress has been made out at Thomas Point Lighthouse – largely due to Hobie’s efforts. 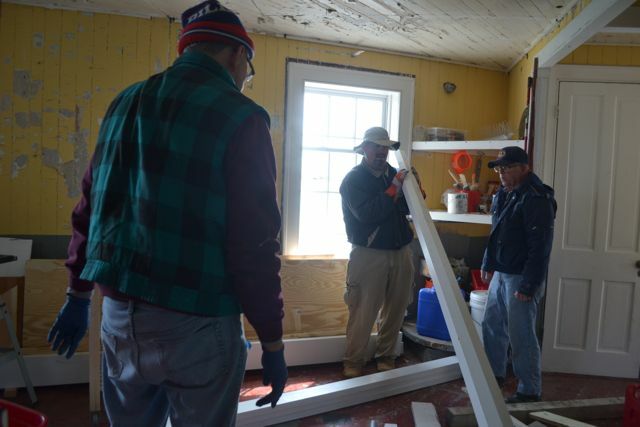 He has contributed countless hours in planning the work and then coordinating tasks once volunteers boarded the light – so I’d like to thank him for all he has done. He will still be volunteering, but he will hand over the coordination tasks to Karl Talbott. So…preservation season is open. 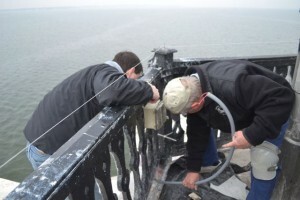 Come join us at one of our preservation dates and get up close and personal to the lights we all love. To assure you spot on one of the workdays please contact us thru the website. Outside Temp in the 50s. Inside Temp – well cold enough to see your breath. 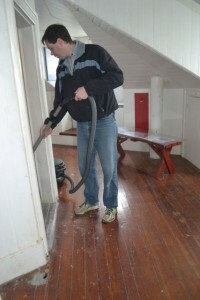 Karl Talbott using cleans light with HEPA Vacuum. Hobie and Karl inspect the light. Volunteers Tony Pasek, Shawn Saez and Hobie Statzer organize work room. Cory Talbott cleans out one of the closets. Volunteers Bob Stevenson and Karl Talbott work on bird squawker. Cory and Bob call it a day. 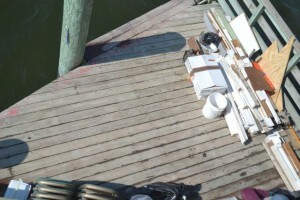 Deck after scrubbing with items stacked for removal. 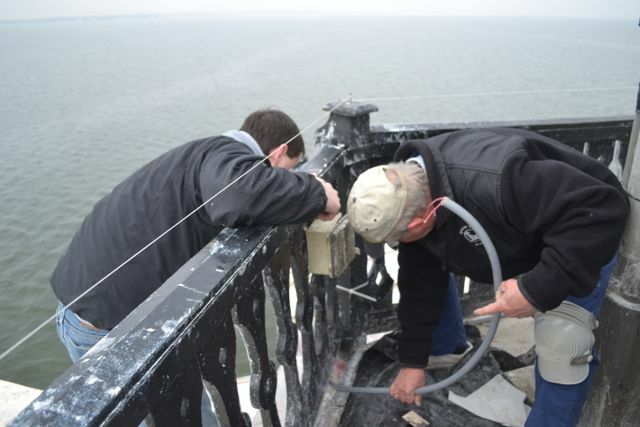 Volunteers with obsolete sign removed from Lighthouse.